Getting there: New Zealand is an apprx 13-hr flight from LAX. Your USA Gateway airports are LAX, SFO and IAH. Remember: You’ll leave the USA in the late evening and arrive two mornings later. (I.E. Leave Mon arrive on Wed). New Zealand is a 3.5 hr flight from Eastern Australia. New Zealand’s Airports: New Zealand’s international airports are Auckland, Wellington and Christchurch. Some flights from Australia also land at Hamilton, Palmerston North, Queenstown and Dunedin. New Zealand Entry: All visitors to New Zealand must have a valid passport that is valid for at least 6 months beyond the end of your stay in New Zealand. As a US citizen, you do not need a visa or permit to visit New Zealand if you are staying less than 3 months. Best time to visit New Zealand is in late Feb, March, November and early December. Climate: In New Zealand the seasons as reversed with our winter being NZ’s summer. Higher altitudes are always cooler. The climate is maritime, which means that the weather can change with amazing rapidity, especially in the mountains. The North Island is sub-tropical with Summer temperatures averaging 75 to 54 degrees. The South is temperate with warmest months being December – February (average temp. 72 to 54 degrees) and the coldest are June -August. (average temp. 54 to 37). On the South Island, there exists a wetter climate on the west side of the mountains and a dryer climate on the east side. Here one can find some of the best skiing & snow boarding in the World, ski season usually runs from June to October. Getting around: I recommend the many coach tours which travel between the popular cities as well as a self-drive vacation. New Zealand also has an extensive bus network, with the main operator being InterCity Services on main bus routes are frequent (at least once a day). When in the cities, you’ll find that since they aren’t massive cities, walking is the best way to get around the cities. Using your electronics in New Zealand: New Zealand is a very modern country with cell service available in all major cities. You’ll find access to free Wifi throughout Australia’s airports, shopping malls, coffee shops and more. Hotels are still catching up and for many hotels you may be required to pay a daily Wifi fee. Almost gone are the day of buying a SIM card for your phone however those are still available, which provide you with a local number however they are not cheap. I recommend checking with your US phone carrier and find out if you can purchase an international data plan though now offer carrier provide a free intentional data (though you’ll only get limited data however google maps will work with that) with free texts and inexpensive phone calls. New Zealand Self-drive Trips: Remember that New Zealanders drive on the left had side. No special license is required. is recommended as the roads are good and well signposted and the distances short. Rentals of cars, motorcycles and camper vans are popular with a range of special deals available. There are plenty of boat services, including the Inter islander ferry (operating between Wellington in the North Island and Picton in the South Island). And finally, there’s always cycling around the country. Many travelers describe New Zealand as a cyclists’ paradise: it’s clean, green, un crowded and unspoiled, and there are plenty of places where you can camp or find cheap accommodation. Bicycle rental can be daily, weekly or monthly and is inexpensive. New Zealand Self-Drive vacations: New Zealand’s roads are great for self-drive vacations. You’ll find the adjusting to left hand driving isn’t as difficult as you think. Roads are very well maintained, signs are clear and traffic is light compared to traffic in the USA. You will not need a special driver’s license if you are from the USA as your license will suffice. Tipping: Tipping is not mandetaory in Australia. Tipping is not expected anywhere, and historically has not been the norm – basic wage rates and overtime payments in the hospitality industry have generally been protected. You won’t cause offence if you don’t tip, aervice providers however are always grateful if you leave the change. Electricity: The domestic electrical supply in Australia is 240 volts, 50Hz Ac and uses 3 pin sockets. For the larger 110-volt appliances (e.g. hair dryers) converters are needed. If you have a newer electronics, such as a phone or computer, then you will only need an adapter and not a voltage converter as newer electronics have the conversion made. Taxes: The Goods & Services Tax (GST) adds 12.5% to the price of just about everything which is INCLUDED in all prices listed. Unlike in the USA, taxes are not added at the end of your purchase. Currency: New Zealand’s unit of currency is the New Zealand dollar (NZ$), comprising coins with values of 5, 10, 20 and 50 cents, $1 and $2, and notes with values of $5, $10, $20, $50 and $100. Foreign currency can easily be exchanged at banks, some hotels and Bureau de Change kiosks, which are found at international airports and most city centers. New Zealand doesn’t accept US dollars to purchase items or services. ATM & Credit Cards: Automated Teller Machines (ATM) are widely available at banks, along main shopping streets and in malls. International credit cards and ATM cards will work in New Zealand. Be sure to contact your credit card bank to let them know that you will be using your card abroad. The region known as Northland lies to the north of Auckland. Northland is almost sub-tropical with small country towns, island studded bays, long sandy beaches and pockets of subtropical forest. It is also of significant historical importance. In 1840 Maori and European signed the Treaty of Waitangi joining the two as one nation. Whangarei is the largest center in Northland with a population of over 44,000 and a wide range of accommodation, restaurants, craft shops and attractive gardens including a fernery and conservatory. Many sheltered surf beaches are within an easy 45 minute drive from Whangarei. Bay of Islands. Is just 4 hours by car from Auckland and one of NZ’s most popular destinations. More than 150 islands that dot the series of inlets and bays surrounding the small towns of Paihia, It’s a land of rolling, rugged countryside. Here you can find, quiet NZ towns, sparkling island-studded bays, long silvery beaches, and packets of lush, subtropical forests. Activities include diving, fishing excursions, trips to Cape Reinga (northernmost point of the country), Kauri Forest trips or simply enjoy the view. Russell and Waitangi make up the Bay of Islands. Paihia is the main visitor center offering a wide range of accommodation and excellent seafood restaurants, and is also the departure point for most excursions. Waitangi, within walking distance of Paihia, is the site where the the Treaty of Waitangi was signed in 1840 between Maori Chiefs and representatives of the British Crown. Russell is one of the oldest towns in New Zealand and is a 20 minute ferry ride from Paihia. Cars may be transported by the vehicular ferry from nearby Opua, a deep-water port. Kerikeri, 14 miles/23 kms to the north of the Bay of Islands is a thriving small town. Surrounded by citrus orchards, Kerikeri has many crafts and shops on its main street. Auckland. The main gateway to New Zealand, Auckland has a multi-cultural population of more than a million people, and is New Zealand’s largest city surrounded by expansive parklands and water. Cultured and cosmopolitan, progressive and historic, Polynesian and European, accessible to beaches and forests, adventure sports and leisure activities, Auckland offers something for everyone. Auckland sprawls for 30 miles/48 kms over the narrow isthmus that separates its two harbours – the Waitemata to the east and the Manukau to the west. Auckland offers both sheltered and rugged surf beaches, a harbor scattered with islands, large farm-like parks, reserves and bush-clad ranges and a skyline clearly showing the remains of many of the 48 extinct volcanoes on which Auckland was built. Expect great shopping, dining and entertainment and the bustle of an international city. There are more boats per capital in Auckland than any other city in the world. The Coromandel Peninsula is covered in native forest and bush and is surrounded by a stunning beach-studded east coast. The region is a popular holiday resort for Aucklanders, and is also home to many craftspeople and seekers of alternative lifestyles. A strong conservationist lobby among the sparse population has preserved the Coromandel’s unspoiled state. At one time gold, Kauri logs, and gum were all extracted from the rugged forest country. The Coromandel Peninsula offers many excellent sandy beaches for surfing, fishing, and swimming. Big-game fishing and hiking are also popular activities. Towns that make up the Coromandel Peninsula include Thames the largest town, Coromandel, one hours drive north of Thames, and Whitianga, the second largest town on the Coromandel Peninsula. Other areas to visit include Whangamata, Pauanui, Mercury Bay, Hahei, Paeroa, and Waihi. Bay of Plenty Tauranga, Maori for sheltered waters, is the largest residential and commercial area of the coastal Bay of Plenty. This region enjoys one of the sunniest climates in New Zealand, ideal for growing kiwi and citrus fruit for which the region is famous. A harbor bridge links Tauranga with Mount Maunganui, one of New Zealand’s largest ports, and among its most popular beach resorts. The whole Bay of Plenty region offers outstanding surf beaches as well as magnificent waters for big game fishing. Located on the eastern edge of the Central North Island’s thermal region, the Bay of Plenty has thermal hot pools as well as one of the world’s most accessible active volcanoes, White Island, 30 miles/48 kms offshore from Whakatane. Waikato and Waitomo. Hamilton is the main center of the Waikato and is located on the Waikato River, the longest in New Zealand at 265 miles. Hamilton is supported by small prosperous towns such as Cambridge, known for its large English trees; Te Awamutu, renowned for its rose gardens and historic St.Johns Anglican Church; Otorohanga, whose zoo boasts the largest walk-through aviary in the Southern Hemisphere; and Matamata, the center of the country’s bloodstock industry. The Waikato region is one of the world’s greenest. The volcano enriched soil supports lush grass for raising cattle and thoroughbred horses. The major attraction in the area is the famous Waitomo Caves with its glow worm grotto and limestone caverns. Less than 50 miles to the south of Hamilton, the Waitomo Caves make up a vast underground network of water-sculpted, limestone grottoes. Here you can go tube rafting on an underground stream or slip silently through on a barge to view the magical lighting created by glow-worms overhead. The more adventurous may abseil (rappel) 300 feet down into huge caverns. No previous experience is required to do this. Rotorua is within 4 hours drive form Auckland. The lakeside city of Rotorua is one of the North Island’s most famous destinations for overseas visitors and an important center of Maori culture. It is also the center of New Zealand’s thermal region, with geysers, steaming lakes and streams, mud pools, multi-colored silica terraces and hot mineral pools known for their curative properties. Rotorua has some of the best trout fishing in New Zealand and 11 major lakes to chose from. For centuries the Maori have taken advantage of the hot springs for cooking and bathing, and Rotorua is one of the best places to learn about their culture, both traditional and contemporary. At the Maori Arts and Crafts Institute in the Whakarewarewa Reserve, you can watch highly skilled Maori carvers and weavers at work. A hangi or feast is the traditional method used by the Maori to prepare their food. Food is cooked underground and heated by the thermally heated earth. Many hotels offer Maori concerts and the chance to sample this very distinctive type of food. Many maraes or meeting houses also offer a hangi feast and concert. Taupo An hour’s drive south from Rotorua, Taupo sits on the northern shore of Lake Taupo, New Zealand’s largest lake.” The trout capital of New Zealand,” Lake Taupo is justly renowned for its fishing, and plenty of guides and boats are available. Many people just enjoy cruising or simply relaxing in this incredibly beautiful spot. For the more active, there are helicopter rides, horse treks, bungy jumping, rafting and golfing. At the southern end of the lake is Turangi, also famous for its trout fishing. This is the base for whitewater rafting on the Tongariro River. Tongariro National Park In the park, Mount Ruapehu (9,177 feet), the highest peak in the North Island and a live volcano, is the site of the Whakapapa and Turoa ski areas which both have world-class facilities. For summer, there are extensive tracks and huts throughout the park, as well as shorter walks and nature trails and historical Maori sites.The town of National Park services the ski area of Whakapapa. Ohakune is the town at the base of the Turoa Ski field. The East Coast The eastern region of the North Island, Eastland, is noted for its sparse population, proud Maori history and high rugged mountains. From the tallest of these, Mount Hikurangi, you can be the first in the world to see the dawning of the new day. Along the coast, from Opotiki to Gisborne, a stunning 200-mile drive winds slowly and scenically around the entire East Cape. This is ideal motor home or camping country, where there are no towns, only small villages selling provisions and fuel. Behind these small, historic coastal settlements is wild, mountainous sheep ranching country. Gisborne The main city of the isolated Eastland region, Gisborne is a pleasant resort town situated on a broad bay. (Gisborne was the first city in the world to welcome the new millennium.) The surf beaches and sunny, warm climate here have long attracted New Zealanders on vacation. The area boasts some of the country’s best surviving carved Maori meeting houses and churches. West of Gisborne, the vast, remote, forested wilderness of the Te Urewera National Park is the largest untouched expanse of native forest in the North Island, beautifully endowed with lakes, rivers and waterfalls. The scenic highlight is the sparkling gem of Lake Waikaremoana, and there are excellent hiking trails and short walks here, including the 30-mile Lake Waikaremoana Track. Bird watching, hunting, fishing, canoeing and boating are all spectacular. Napier– Hawke’s Bay Napier is the port for the Hawke’s Bay region. It is best known for its man made treasure – its glorious Art Deco buildings. Built following a disastrous earthquake and fire which destroyed the city in 1931, Napier now claims to have the largest concentration of Art Deco buildings in the world. well preserved or beautifully restored. Interesting and informative guided Art Deco walks are provided by the local Art Deco Trust. A sightseeing must is the beautifully landscaped, oceanfront Marine Parade, with its gardens and many attractions. The city’s cafes and restaurants add to the ambiance of a charming seaside resort. Hawke’s Bay is famous for its world-class wines and is home to 30 wineries. The region is also New Zealand’s largest producer of apples, pears and peaches. Taranaki The most striking natural feature of Taranaki is the classic, almost symmetrical, volcanic cone of Mt.Taranaki (also known as Mt. Egmont). A drive, or walk on one of the many forested mountain trails on Mt. Taranaki affords spectacular views of the almost perfectly circular park spread out below. Greener-than-green dairy pastures stretch as far as the eye can see. Not to be missed are the beautiful Dawson Falls. The main provincial center is New Plymouth and other smaller towns are Inglewood, Stratford, Eltham and Hawera. Surfing is also popular on this rugged coastline. Wanganui In an area of coastal farmlands and small rural communities, the city of Wanganui lies at the mouth of the historic Whanganui River. Visitors can travel up river by jet boat or riverboat into the heart of the Whanganui National Park, or canoe downstream over gentle rapids.You can visit villages along the way, where local Maori welcome visitors. Rangitikei The Rangitikei region includes the towns of Taihape, Mangaweka, Hunterville, Marton, and Fielding. There is a huge range of wonderful bed and breakfasts and farmstays that feature glorious gardens such as Rathmoy, Cross Hills, Cairnmuir, Titoki Point and Lavender Farm. Rafting on the Rangitikei River, horse trekking, jet sprinting and a wide selection of crafts from pottery, to ceramics are also on offer. Just over 2 hours from Wellington and less than an hour to the closest ski field the Rangitikei is perfectly located on State highway 1. Palmerston North Palmerston North serves the surrounding wealthy sheep and cattle farming region, commonly referred to as the Manawatu. Many large and beautiful private gardens are available for viewing. Garden tours are extremely popular here. 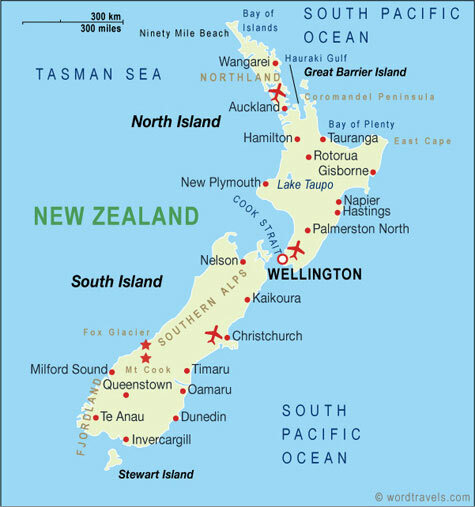 The Central Region This region of New Zealand encompasses parts of both the North and South Islands. In the North Island, Wellington, the nations capital, and the Wairarapa make up part of this region while in the South Island, Marlborough and Nelson complete the union. All four areas compliment each other and offer an excellent way to experience a great deal of New Zealand in a short amount of time. Wellington. New Zealand’s capital is a superbly compact city, set dramatically on the shores of a fine, deep harbor enclosed by a natural amphitheater of wooded hills. The second largest city, Wellington is the political center of New Zealand. Wellington has a vast range of accommodation ranging from top class hotels to middle of the range, budget and apartment style accommodation. Vibrant, exciting and cultured, it combines the stimulation of a sophisticated big city with the friendliness and warmth New Zealanders are famous for. Wellington is known as the restaurant capital of New Zealand. Many of its great cafes, funky bars and ethnic-inspired restaurants are within walking distance of each other, and its sidewalks are enlivened by street performers. Look for restaurants and bars in the Courtney Place area, namely Blair and Allen Streets, or try the Queens Wharf. Wellington’s nightlife is a tribute to its passion for the arts. It is home to the national orchestra, ballet and opera companies, four professional theaters and the national schools of dance and drama. The Kapiti Coast is 20 miles/32 kms north of Wellington city. A popular spot for Wellingtonians to spend their holidays, the Kapiti Coast has whitewater rafting, swimming, boating, hunting, golf, horseback riding, and bush walking. Marlborough. The Marlborough Sounds, made up of sheltered waterways, meanders for more than 600 miles (966km) around secluded coves and pristine beaches, with many spots accessible only by boat. The area has unlimited opportunities for cruising, sailing, diving and fishing. The Queen Charlotte Walkway, one of New Zealand’s walking tracks contains both bush and coastal scenery. Marlborough’s long, hot summers and frosty, clear winters make it ideal for grape growing and its 30 wineries produce some of the world’s finest white and sparkling wines. They can be sampled on wine tours around Blenheim. Blenheim is a busy provincial town of pleasant parks and gardens, which enjoys more sunshine than anywhere else in the country. Kaikoura. 2.5 hrs north of Christchurch or 2 hrs south of Blenheim, Kaikoura was once famous for its rock lobsters, but is better known now as one of the few places in the world where it is possible to view, at close range, huge sperm whales, along with dolphins, seals and great marine birds. This region’s unique activities include swimming with the dolphins and fur seals. Nelson. Nelson’s mild climate is ideal for horticulture. Nelson is a large fruit growing region in New Zealand and supplies the nation’s tobacco and hops. Small boutique wineries, often with cafes, flourish in the Moutere’s protected, sun-drenched valleys where you will also come across local breweries and roadside produce stands. Quality studios, art and craft shops abound in the city and district. Kahurangi National Park, a wilderness of lush rainforest and awesome limestone formations, is the site of the Heaphy and Wangapeka tracks. Nelson Lakes National Parks’ high peaks and beech forests and the jewel-like lakes of Rotoiti and Rotoroa can be seen from fabulous walks and hikes. Abel Tasman National Park is primarily a coastal park. Its subtropical native forests stretch down to golden-sand beaches, estuaries and secluded bays. Marahau Beach, at the southern end of the park, near Motueka, offers kayaking, horseback riding, boat rentals and water taxis to various points in the park. The drive to Golden Bay, around the inland side of the Abel Tasman National Park, climbs over Takaka Hill, and the views down into Takaka Valley and out over Kahurangi National Park are incredibly spectacular. In Golden Bay, you can enjoy the uncrowded golden beaches, or visit the mesmerizing, crystal clear Waikoropupu Springs. Along Farewell Spit is a 15-mile sand spit extending into the bay, where you can take a 4WD safari to see a migratory bird sanctuary of international significance. West Coast. The West Coast is a narrow strip of land hemmed in between the South Island’s formidable Southern Alps and the Tasman Sea. With most of its natural environment still intact and preserved in six national parks and a World Heritage Site, the Coast is an unspoiled, scenic gem. This wild, sparsely populated region of mountains and glaciers, tranquil lakes, unruly rivers, lush rainforests and a magnificent 360-mile (600km) coastline overwhelms visitors with its grandeur and beauty. The northern West Coast is often called Buller after its main river. The major town is Westport, a port with a coal-mining history. Nearby, Cape Foulwind is the site of the country’s most accessible fur seal To the north is is Karamea, with its unusual limestone topography, an area of caves, sink holes, and disappearing rivers. Here the towering Oparara Arch is the result of thousands of years of erosion by the Oparara River. Between Westport and Greymouth, the coastline features the unique Punakaiki Pancake Rocks and blowholes. In south Westland, Whataroa, near Okariko, is the site of the only breeding station in New Zealand for the majestic white heron, a bird revered by the Maori. South Westland also has some of the most dramatic views in New Zealand the soaring Southern Alps, forest-fringed lakes, lush rainforests and the spectacular Franz Josef and Fox Glaciers. Canterbury, a flat, broad plain, borders the Southern Alps. Christchurch nestled in the heart of Canterbury is the South Island’s largest city with a population of over 330,000. Christchurch is New Zealand’s “Garden City ‘ full of many beautiful parks and reserves. Punting along the Avon River, through the inner city is a popular way to view the distinctively English character of the city. Hanmer Springs is a serene, alpine thermal resort in a natural wonderland, where you can relax in the hot, mineral waters or walk the trails through plantation forests planted early in the century. Other activities include bungy jumping, mountain biking, jet boating, rafting, horseback riding, golf and skiing. Lyttelton, Just over the hills from Christchurch, nestled in one of the many harbors that indent Banks Peninsula, is the bustling port of Lyttelton, where Canterbury’s first settlers landed. Also on the Banks Peninsula, Akaroa, once a French settlement, still has French street signs and a charming Gaelic ambiance, along with quaint cottages, an excellent folk museum, French restaurants and a marvelous cheese factory.Mount Hutt, 56 miles/90 km south west of Christchurch, is one of the most popular ski fields in New Zealand. International competitions are staged here each year. The ski season at Mount Hutt is May to October. At the base of Mt Hutt lies the small country town of Methven, which in winter becomes a lively resort for one of New Zealand’s top ski fields. Arthur’s Pass is a two-hour drive from Christchurch. Nestled in the foothills of the Southern Alps, it is surrounded by the spectacular Arthur’s Pass National Park, popular for climbing, hiking, short walks, hunting and fishing. A great way to see this area is by taking the TranzAlpine. Queenstown lies beside Lake Wakatipu at the foot of The Remarkables mountain range. It is the South Island’s most popular resort and the base for excursions into the surrounding mountains and nearby fiords, including Milford Sound. In winter, Queenstown is New Zealand’s main skiing center, and in summer even larger numbers of visitors come to take part in outdoor activities ranging from trout fishing to paragliding, and whitewater rafting to bungy jumping. The town is compact enough to get around on foot, with courtesy vehicles, buses or taxis available to take you to outlying attractions. Queenstown has more than a 100 restaurants, plenty of entertainment, accommodations to suit all tastes and great shopping. Wanaka, surrounded by majestic mountains lies on the shores of the glacial formed Lake Wanaka. The township is in some respects a quieter, more relaxed version of Queenstown, with a range of accommodation, from a top-class resort to motor lodges and camp grounds. The town also has a superb selection of restaurants and cafes. Rising beyond the lake, magnificent Mount Aspiring, the focal point of Mount Aspiring National Park, is a favourite with hikers. Wanaka township sits at the base of the Treble Cone ski area, a favourite with snowborders. Cardrona ski area is situated on the Crown Range between Wanaka and Queenstown and is an ideal ski field for families. Fiordland. Covering nearly three million acres, wet, wild, rugged and remote, Fiordland is one of the largest national parks in the world. A World Heritage Site, this is nature on a grand scale. Protected by its isolation, some of New Zealand’s rarest birds are found here, as well as some of the country’s best-known hiking tracks. Te Anau, an attractive resort on the shores of Lake Te Anau, is the starting point for the Fiordland National Park and its many outdoor activities. Sometimes referred to as the “walking capital of the world ” Te Anau acquired this reputation from the Milford, Kepler, Routeburn, Greenstone, Hollyford and Dusky Tracks. Its accommodations range from four-star hotels and motels, to backpacker hostels, campgrounds and farmstays. It also has fine restaurants serving the specialties of the region: lobster, venison and fresh fish. Milford Sound is the most accessible and best known of the glacier-cut fiords. Lined with mountain peaks that rise sharply to heights of 7,000 feet, the most famous of which is Mitre Peak. Lush rain forest and majestic waterfalls abound. Wildlife includes the Fiordland Crested Penguin, fur seals and dolphins. Dunedin. The South Island’s second largest city and the commercial center of Otago is Dunedin, a gracious, distinctive city of grand 19th-century buildings and beautiful gardens. Dunedin is a city of culture and learning, distinguished by libraries, museums, parks, churches, and New Zealand’s first university. Bearing the Gaelic form of the name Edinburgh, Dunedin was settled by Scots, and made prosperous by the Otago gold rushes of the 1860s. Dunedin’s Victorian character is preserved in its many fine stone buildings. The Otago Peninsula, only 15 minutes from downtown, has an abundance of wildlife, from seabirds, fur seals and the rare and endangered yellow-eyed penguin (hoiho). At the end of the peninsula on Taiaroa Head, the mighty albatross glides effortlessly on the updrafts. Nowhere else in the world does this, the largest of the world’s seabirds, breed within such easy viewing access. Oamaru. the town of Oamaru was also built from the wealth that came out of the Otago goldfields. In addition to its grand, stone Victorian buildings and fine gardens, it is noted for the two species of penguins that inhabit its shores. Farther up the coast a unique geological phenomenon, the Moeraki Boulders look as if giants have scattered enormous toy balls on the beach. Central Otago was used during the gold rush days of the 1860s by thousands of miners. Along the Goldfields’ Heritage Highway, the road runs through the quaint villages of Clyde, Lawrence, St. Bathans and Naseby. Alexandra is the main town on the mighty Clutha River. Clyde and Cromwell are also ideal to explore. Southland is a region of lush green farmlands, rainforests, spectacular coastal scenery, small towns and the longest daylight hours in the country. Its rivers and streams and lakes are filled with sizable trout, and fishing here is a way of life. The largest urban center, Invercargill is New Zealand’s southernmost city. East of Invercargill on the Southern Scenic Highway from Dunedin, the Catlins Forest Park offers some great walks and magnificent coastal scenery. Unspoiled in its isolation, Stewart Island is like stepping back in time. Reached by catamaran, aero plane or ferry across Foveaux Strait, this is the ultimate spot for anyone seeking peace and tranquility. Here too are superb bush walks and great launch cruises in some of the most beautiful of New Zealand’s coastal scenery. Bird watchers will find the island richly rewarding, and you might even spot a kiwi in its natural environment. Activities include saltwater fishing, sea kayaking, and hiking on trails provided with huts. There is comfortable accommodation at Halfmoon Bay. New Zealand is a Mecca for thrill seekers and anyone interested in wide open spaces and physical activities. Above the ground you can go bungy jumping, parachuting, skydiving, abseiling and flying; on the ground you can go tramping, mountain bike riding, skiing, horse riding, rock climbing and ‘zorbing’; underground you can go surface caving, cave rafting, and hydro sliding; and on the water you can go jet-boarding, white-water sledging, rafting, boogey boarding, canoeing, kayaking, surfing, and scuba diving. If there is a difficult and challenging way to get from one point to another you can do it somewhere, somehow, in New Zealand. Despite the number of off-beat activities available, the most popular one is still tramping (Kiwi lingo for hiking or trekking). Thousands of kilometers of marked tracks and an efficient network of trampers’ huts make it a viable activity for everyone from experienced hikers to country strollers. Be warned that some of the more popular tracks such as the Great Walks will be fairly crowded, especially in summer, so if you prefer solitude contact the nearest Department of Conservation for further information on tramping in their area. New Zealand is also one of the most popular destinations in the southern hemisphere for skiing and other winter sports because of its reliable and abundant snowfall. New Zealand’s skiing season is June thru October. There are a number of ski-package tours available and a variety of ski resorts scattered throughout both the north and south island.